Here’s something to work into your weekend listening schedule. Each year at the Centrum Port Townsend Jazz Festival on Washington state’s Olympic Peninsula, Jim Wilke records concerts for broadcast on his Jazz Northwest. Next Sunday, he will air an all-star sextet of stars who taught this summer in the festival’s jazz workshops. This photo shows Chuck Deardorf, Terell Stafford and Steve Wilson. The first in a series of radio shows from the 41st Jazz Port Townsend airs Sunday, August 16 at 2 PM Pacific Daylight Time. An all-star sextet drawn from the faculty of the Jazz Workshop opens the festival on the first of three nights of “Jazz In The Clubs” in several small venues in downtown Port Townsend. After a week of sharing their knowledge with students, they’re ready to swing with their peers. 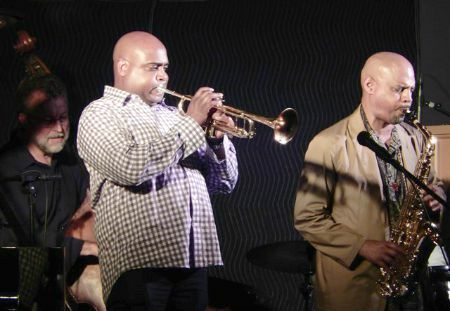 In this group, we’ll hear musicians from New York, L.A., Seattle and Portland…Terell Stafford on trumpet, Steve Wilson on alto, Eric Reed is the pianist, Dan Balmer on guitar, Chuck Deardorf is on bass, Matt Wilson is at the drums. They play both standards and jazz classics, but in some non-standard arrangements. Jazz Northwest is recorded and produced exclusively for 88.5 KPLU and kplu.org. The program is available as a streaming podcast after the broadcast. Programs are archived at jazznw.org.